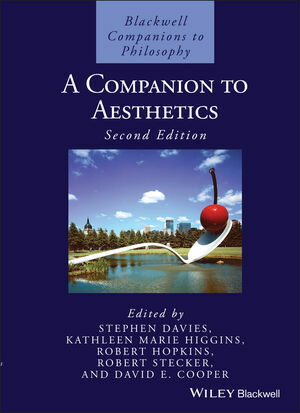 In this extensively revised and updated edition, 168 alphabetically arranged articles provide comprehensive treatment of the main topics and writers in this area of aesthetics. Stephen Davies, University of Auckland, New Zealand, is the author of Definitions of Art (1991), Musical Meaning and Expression (1994), Musical Works and Performances (2001), Themes in the Philosophy of Music (2003), The Philosophy of Art (Blackwell, 2006), and Philosophical Perspectives on Art (2007). He is the editor of Art and Its Messages (1997), co-editor of Art & Essence (2003), and co-editor for aesthetics and the philosophy of art for the Stanford Encyclopedia of Philosophy. He is on the editorial boards of Journal of Aesthetics and Art Criticism,, Rivista di Estetica, Philosophy of Music Education Review, Res Musica, and Philosophy Compass. Kathleen Marie Higgins, University of Texas at Austin, is the author of The Music of Our Lives (1991), and of many books in other areas of philosophy. She is also editor of Aesthetics in Perspecptive (1996), and is on the editorial board of Journal of Aesthetics and Art Criticism. She brings to the project specialist knowledge of Continental philosophy, history of aesthetics, non-Western aesthetics, and feminism. Robert Hopkins, University of Sheffield, UK, is the author of Picture, Image and Experience (1998) and many articles on aesthetics and related topics in the philosophy of mind. His research was recognized by the award of a Philip Leverhulme Prize (2001). He is the first president of the European Society for Aesthetics. He brings to the project expert knowledge of painting, the plastic arts, the imagination, and aesthetic judgment. Robert Stecker, Central Michigan University, is the author of Artworks (1997), Interpretation and Construction (2003), and Aesthetics and the Philosophy of Art (2005). He is co-editor for aesthetics and the philosophy of art for the Stanford Encyclopedia of Philosophy and he has also co-edited editions of Hume's Treatise and of Locke's Essay. He brings to the project specialist knowledge of literature and interpretation. David E. Cooper, University of Durham, UK, has authored, edited and co-edited many books, including Metaphor (1986); Heidegger (1996); The Measure of Things (2002); World Philosophies: An Historical Introduction (1995; 2nd edn, 2003). ; A Companion to Aesthetics (1st edn, 1992). He is currently co-editing Philosophy: The Classic Readings (Blackwell).